Create a quick and easy waterfall effect with our Calpump Spillways. 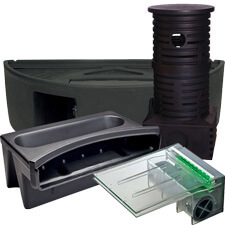 These Spillways are available in two different sizes, a 10", and 18". All of the Spillways include filter media to condition the water for a smooth waterfall effect. The 10" spillway has a 1" inlet with fitting and the 18" have both 1" and 1 1/2" fittings for easy installation. 11" x 11.5" x 10.5"
19" x 11" x 10.5"